Freedom Optimist Soccer – Freedom Optimist Soccer offers recreational soccer in Eldersburg and Sykesville MD for boys and girls from age 3 to seniors in high school. Welcome to Freedom Optimist Soccer! Freedom Optimist Soccer offers a recreational soccer league in Eldersburg and Sykesville, MD for boys and girls from age 3 to seniors in high school. To receive the quickest updates regarding weather related game and practice updates, field status and other information, Like our Facebook page and follow us on Twitter. Call the Freedom Area Rec Council hotline at (410) 549-6296, Option 5 to check on field availability. On weekdays the message is updated by 3pm. Heat Index: 80-89 – Use caution; monitor athletes carefully for necessary action. Heat Index: 90-104 – Use extreme caution; remove helmets and other equipment if not involved in contact. Heat Index: 105-129 – Alter uniforms by removing items where feasible; practice should be shortened with low intensity & limited conditioning. Heat Index: 130 & above – NO practices or games. Activities should be rescheduled for early/late in the day or an alternate date when the heat index is lower. Use Weather Channel (PDF) or National Weather Service (HTML) to calculate Heat Index. At the first sound of Thunder or the first sighting of Lightning – All outdoor recreation council activities are to be stopped and the participants must clear the fields to a protected area and wait 30 minutes before activities can resume. Any additional occurrence restarts the 30 minute count until activities can resume. You can read the official policy at County Heat, Thunder and Lightening Policy. 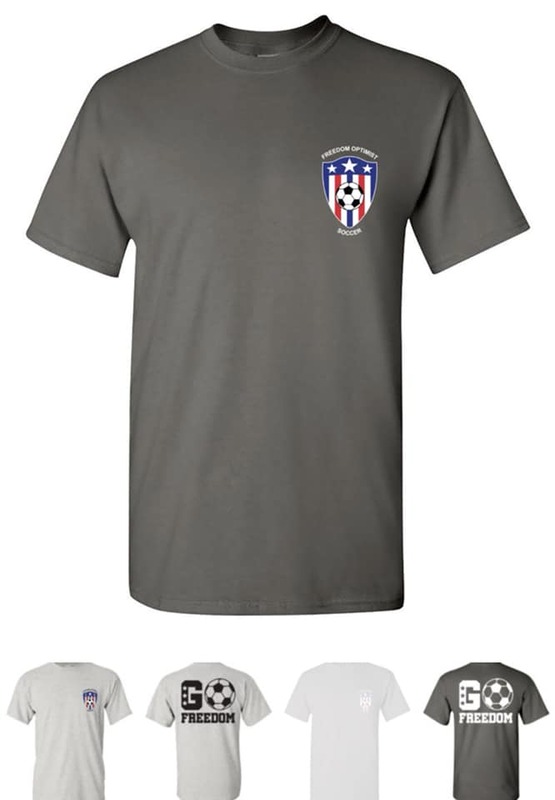 Show your Freedom Optimist Soccer Pride and support the program with Freedom Optimist Soccer Spirit Wear. Visit www.gotspiritwear.com and click on the Shop link in the upper right hand corner and select Freedom Optimist. Spirit wear is great for upcoming holidays gifts. Maybe you really like your coach and want to get them something special. Show your Freedom Optimist Soccer Pride! All proceeds will directly support the Freedom Optimist Soccer program. If you are volunteering in our program as a Coach, Assistant Coach or Team Parent you must register as a volunteer. Make sure you register yourself at https://farc.siplay.com and select the Volunteer option. There is no cost to register. Details about volunteer registration can be found in the attachment Volunteer Registration Information. Volunteers 18 and older must complete the Carroll County background check. Carroll County Department of Recreation and Parks requires background checks for all Board Members, Head Coaches, Assistant Coaches and Team Parents involved in youth sports who are 18 and over. There is no cost to any volunteer for the background check. For volunteers younger than 18, a legal guardian must complete the Minor Consent Volunteer Waiver Form. The instructions to complete the background check can be found in the attachment Carroll County Background Check Requirements (PDF). Or to start your background check, go to Carroll County’s custom application online submitting portal at https://ssci2000.secure-screening.net/escreening/OApp_LoginEntrance.asp?mode=direct&code=450500. and council information (Freedom Area Rec Council) in the body of the email to ccrecvolunteer@ccg.carr.org. Please note in the subject line Freedom Rec Background ID Picture.